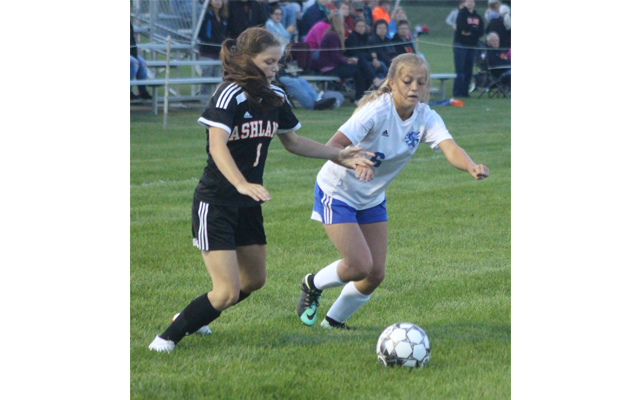 Ashland junior Shelby Stolze scored her 23rd goal of the season with 7:14 to play, allowing the Hornets to play to a 1-1 draw with Central Aroostook Tuesday. Junior Danni Carter picked up the assist on the tying goal. MARS HILL, Maine — Ashland junior Shelby Stolze scored her 23rd goal of the season with 7:14 to play, allowing the Hornets to play to a 1-1 draw with Central Aroostook Tuesday. Junior Danni Carter picked up the assist on the tying goal. Central Aroostook scored the first goal of the match as junior Kayla Martin put one past Ashland goalkeeper Reagan Libby on a corner kick that came with 23:44 left in the opening half. Libby made nine saves on 16 shots, while her opposite, Central Aroostook’s Olivia Blackstone, turned away six of 22 shots during the match. “We didn’t play as well as we are capable, but that could have something to do with Central Aroostook,” said Ashland coach Peter Belskis. “They squish you on one half of the field and are very physical. “But we found out we can compete with them and I’m happy we played them toe to toe,” he added. The Panthers had won their first 11 games of the season, including a 5-1 victory over Ashland way back on Aug. 23. Central Aroostook plays at Easton Thursday and home against Hodgdon Friday to wrap up its regular season. Tuesday’s result guarantees the Panthers the No. 1 seed entering the Class D North playoffs. The Hornets are now 10-2-1 and can secure second place with a victory in their final match against Wisdom Monday in St. Agatha.